Madison Bumgarner hit another home run. Sure, it was against Aaron Blair, and sure, this just keeps Bumgarner tied with Jason Heyward, but, Aaron Blair is a quality prospect in the major leagues, and this keeps Bumgarner tied with Jason Heyward. 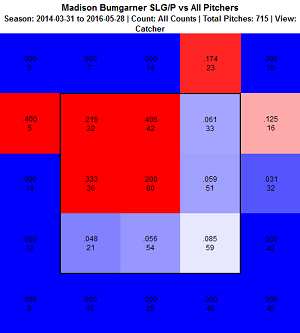 Bumgarner apparently figured out hitting in 2014. Maybe he got bored because he’d already mastered pitching. Since then, over just shy of 200 trips to the plate, Bumgarner has batted .234/.265/.451, good for a 101 wRC+. The next-best offensive pitcher has been Zack Greinke, with a wRC+ of 65. On the mound, Madison Bumgarner is Madison Bumgarner, and at the plate, Madison Bumgarner is Jonathan Schoop. The Giants’ advantage is that no other pitcher hits like a powerful second baseman. The name right after Bumgarner is Kyle Schwarber. When Bumgarner has hit a ball between the lines, he’s had basically the same rate of home runs as Kyle Schwarber. You know the image you have of Kyle Schwarber. Bumgarner has made that kind of contact. You pretty much always have to qualify these things. When we talk about offensively productive pitchers, what’s implied is that they’re productive, for pitchers. Sometimes it’s more than implied. A 60 wRC+ would be horrible for anybody but great for a pitcher. Teams would love if their pitchers could all put up a wRC+ of 60. But this is what’s so nutty about Bumgarner. He’s been an average hitter, period. He’s effectively allowed the Giants to play with an AL lineup in NL games. Since 2014, only Bumgarner and Travis Wood, among pitchers, have managed a positive Win Probability Added. Bumgarner has genuinely helped, and not just by sucking less than his peers. He’s helped by clobbering dingers. Anyway, though, that’s not the point. That’s the opposite of the point. 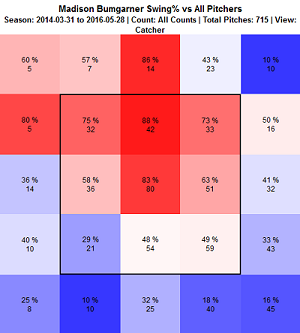 Bumgarner has hit a home run on a relatively low pitch, but those aren’t the pitches he seeks out. He went after that one because there were two strikes, and, what choice did he have? When he has a choice, he chooses with specificity. 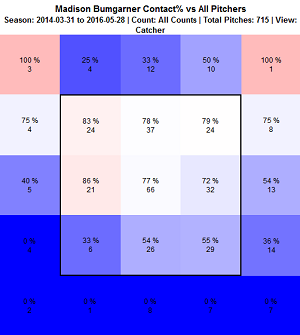 Bumgarner bats with a certain amount of discipline, and he hunts pitches up, spitting on everything else. It’s Bumgarner by a relative mile, and the guy in second place doesn’t play anymore. It is interesting to see three pitchers on the list, but I don’t know what that means. All I care about right now is the guy at No. 1, and it’s a huge difference — by far the biggest in the league among the players observed. 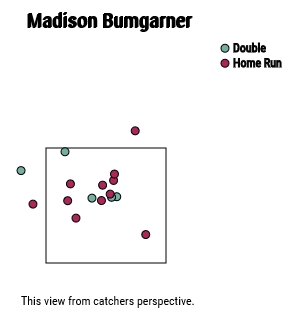 Madison Bumgarner doesn’t just prefer to swing at pitches up. It might be the strongest such preference in baseball. Bumgarner gets locked in there. He looks for pitches up, and he tries to pull them — he’s also managed a top-10 pull rate. Unsurprisingly, his contact success mirrors his pitch preferences. Which is to say, he hits the ball where he wants to hit the ball, and when pitches go other places, Bumgarner doesn’t hit the ball so much. Bumgarner knows where his sweet spot is. He looks for pitches in the spot, and when he thinks he sees one, he gives it a rip. He takes a mighty cut, which is demonstrated by almost literally all of his statistics, and Blair is just the latest victim. Yeah, Bumgarner swings and misses, and yeah, he strikes out, but it does take three strikes to send someone back, which means Bumgarner can get at least three looks for something up. Call him a mistake hitter if you want, but if pitchers didn’t regularly make mistakes, there would never be any runs. Bumgarner has made enough out of the mistakes to float a wRC+ in the triple digits. You don’t need to be told that Madison Bumgarner is a power-hitting pitcher. Really, he’s more like a power-hitting hitter. There’s no questioning the strength, and Bumgarner doesn’t go up and swing blindly, because if he did, he wouldn’t be having this success. He does bat with a plan, and he does do a good job of sticking to it. Bumgarner knows what he wants to crush. The other pitcher simply has to try hard not to throw it. We hoped you liked reading Madison Bumgarner’s Offensive Plan by Jeff Sullivan! Wait…McGehee, he of the perpetual ground ball and GIDP virtuoso is hunting high balls? Is his swing just a Baltimore Chop or something? How does he keep beating it into the ground if he’s always swinging at high stuff? Does he just whiff on everything above the belt? Derek Jeter batted ball profile is like McGehee’s – the ultimate baltimore chopper – and after Bum is second on the high pitch rate list. I don’t know what that means other than Bum is different from at least two of the people on that end of the pitch zone curve.